A large segment of the triage "Requires Editing" votes are simply wrong. The people voting don't understand the essential difference between requires editing by OP and requires editing ... by some random other user to fix minor glitches. As a result: a large number of entries on "Help and Improvement" simply don't belong there. instead of giving the OP immediate feedback (by closing/putting on hold), the questions sit around for hours, days; before somebody shows up and makes a pointless edit, that makes the question "nicer to read", but still leaves it "unanswerable". people taking "help and improvement" seriously ... spend a lot of time not editing, but downvoting questions, and doing the reasonable close vote. The new "labels" are just a proposal, better wording is possible. The new order of buttons does (somehow) (imho) reflect the likelihood that the buttons should be used, "Requires editing by questioner" to be the almost default to click. It doesn't matter that the help text is right there. It doesn't matter that there is a link to more help text explaining that thing. They see the buttons, and click the wrong one. But please note: 99% of the folks I spoke to, they are eager to improve and do better. The majority of people doing the reviews wants to contribute in meaningful ways. Thus we don't need to look into complicated changes, just make it easier for the average reviewer to do the right thing! As said, for me one problem with wrong triage vote is lack of experience. Honestly, I think that only people who have done 50 or more edits (ideally on H&I!) should be able to vote there. And looking a bit deeper, I would even claim that maybe we talk about a 10K reputation limitation on top of that. In a reasonable world, a reasonable suggestion like yours would be actioned promptly. Stack Overflow the company is no longer a reasonable world; I'm not certain that they even have devs employed there anymore, except Marc Gravell. There's no other reasonable explanation for the fact that numerous useful changes to the Help and Improvement queue have been suggested since it was launched three-and-a-half years ago, yet almost none of them (see the answers in that question) have been implemented - even incredibly basic things like text changes, for crying out loud. I poked about the H&I queue almost exactly a year ago to draw attention to the fact that it either needs TLC or a bullet to the back of the head, and nothing was done; I'll let you guess what the fate of your suggestions, and indeed the fate of any and all questions related to bettering H&I going forward, will be. tl;dr your intentions are good, but you're wasting your time. I think it's a really good idea to have a clearer distinction between Requires Editing and Unsalvageable. which is, as you stated, open for change of words, so I hope a middle ground can be found. I feel like new users wouldn't associate a thought process of "This needs editing" with a closure flag, which is the case here. 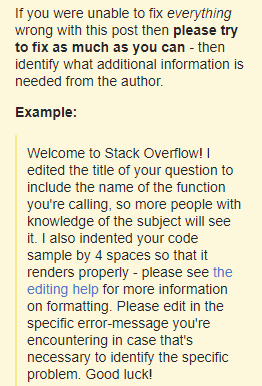 If you were to click "Requires Editing by Questioner", a dialog pops up saying "This question doesn't belong here because:", which I think will make users think: "Oh no, it belongs here, it just requires a few edits". Furthermore, there are different flag options (Duplicate, spam, rude) that simply do not fall under the category of "Requires editing by questioner", whereas the word Unsalvageable covers all these grounds. The close vote queue: where "unsalvageable" questions go to die, (unless they're spam which gets deleted directly from flagging). In the past 30 days, over 63.7 thousand questions ended up there... And just over 8.7 thousand were completed. The rest aged away. There's no point in throwing more stuff in that queue. You can ignore most of those columns; this is just a little query I use to keep an eye on how the queue is doing. The important ones for this discussion are PctClosedOrDeleted and PctEdited: a majority of questions triaged as Unsalvageable do get closed or deleted, while a majority of questions triaged as Requires Editing (referred to internally as "should be improved", since that was the original name) do get edited. I wish both numbers were higher, especially the first one. Frankly, I wish deletion was a heck of a lot easier. But for the purpose of review, it doesn't have to be: the purpose of triage is to maximize the value of a limited resource, not stretch it ever-thinner. "not edited" means the review didn't actually complete - either it aged away, or the question was deleted while the task was still in the queue. the numbers don't match the ones above, as not every question that goes through Triage as "Requires Editing" ends up in the H&I queue (questions that get answered, closed, deleted, or score < -1 are excluded). clearly most of the edits observed in the Triage stats aren't coming from the H&I queue. There are less than half as many edits as are indicated for questions triaged as Requires Editing. the outcomes for these questions are... pretty terrible. Not the answer you're looking for? Browse other questions tagged discussion feature-request triage help-improvement .